Found beyond the orbit of Neptune, the Kuiper Belt is the most distant area in our solar system, and it’s home to the now six known dwarf planets (including Pluto) and other cosmic objects. It could also be the home of our system’s rogue ninth planet, the (un)imaginatively titled Planet Nine. Researchers from the University of Arizona (UA) have weighed in on the search for this phantom planet in a new study published in Astrophysical Journal Letters. Led by Regents’ Professor of Planetary Sciences Renu Malhotra, the team at UA’s Lunar and Planetary Lab found that the orbital behaviors of some Kuiper Belt objects (KBO) could likely be explained by the presence of Planet Nine. KBOs are typically influenced by the gravity of the four big planets in our solar system, but not so for four of the most distant KBOs. These extreme KBOs, or eKBOs, show large orbital eccentricities, getting close to the Sun at one point and swinging farther out at another. 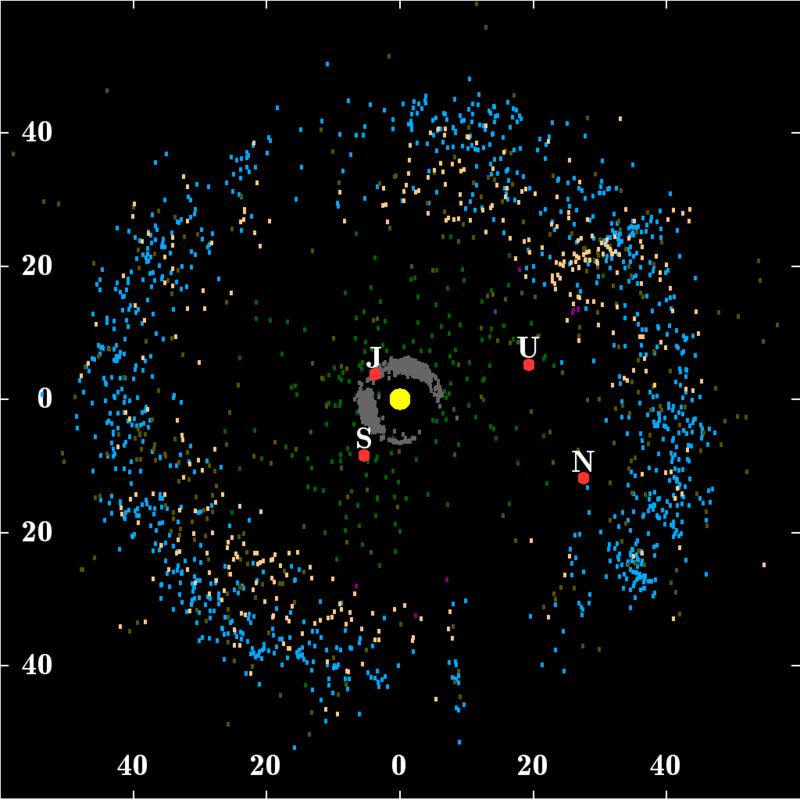 “We analyzed the data of these most distant Kuiper Belt objects and noticed something peculiar, suggesting they were in some kind of resonances with an unseen planet,” Malhotra explains. Furthermore, the orbital period ratios of these eKBOs are small whole numbers, suggesting an elliptical orbit that only the presence of a massive planet could stabilize, one the researchers estimate has roughly ten times the mass of Earth. The results of the UA study were presented at the joint 48th meeting of the Division for Planetary Sciences of the American Astronomical Society and 11th European Planetary Science Congress in Pasadena, California this week. While Malhotra believes their paper provides valuable information about the hypothetical Planet Nine, they are aware that they haven’t definitively proven its existence just yet. Despite the many observed Kuiper Belt occurrences and computer models that suggests Planet Nine exists, until someone actually sees it, we can’t be sure it’s there, but we might not have to wait too much longer for confirmation. Over the next few years, our capacity to see our galactic surroundings will significantly improve with the launch of better space telescopes, including the James Webb Space Telescope (JWST), which is expected to be ready for use in 2018. Until then, evidence like that uncovered in the UA study can tell us a lot about the unseen corners of our solar system.